We've been enjoying a few snow days here in Nashville this weekend. There's been way more ice than actual snow, but it's been so nice to stay home with Cameron and the dogs and get some things done around the house. Y'all know how much I've been raving about Noelle, a new boutique hotel located downtown next to Printer's Alley. 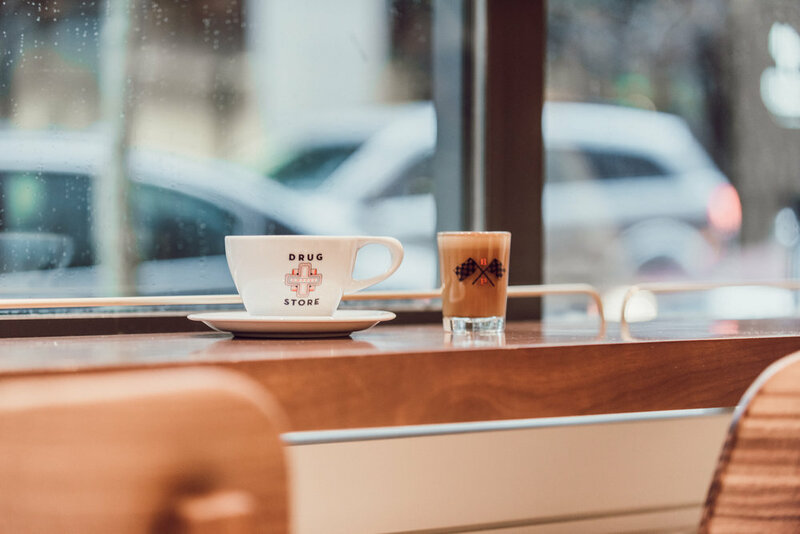 Cameron and I recently got to check out Drug Store Coffee, Barista Parlor-run coffee shop located in the hotel's lobby. Their bourbon vanilla latte is the perfect drink to sip on a cold day, and Cameron is a huge fan of their cortado. It's an intimate and well-designed space that's perfect for a quick work meeting or coffee date with a friend. Now let's get down to the outfit details. You might not believe me when I tell you this, but I saved around $360 on this ivory cableknit sweater. It was originally almost $400 (see here), but my mom found it on sale around Christmas for just $39.97 here. 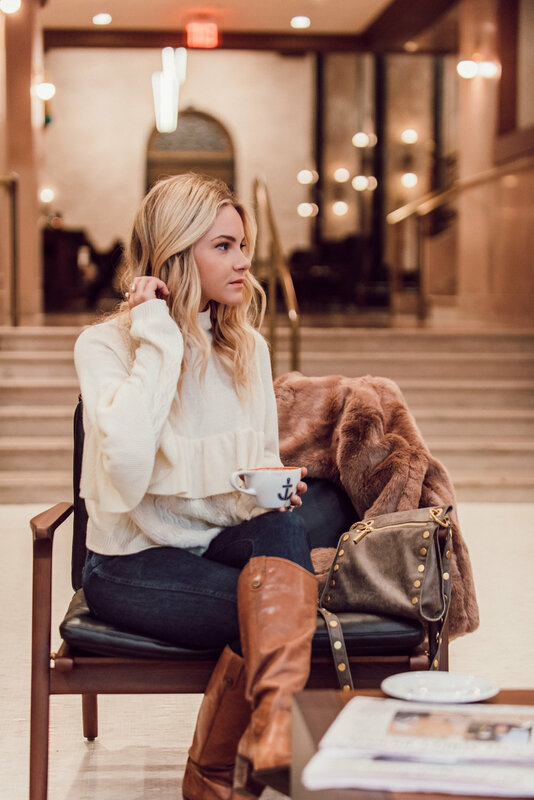 It's one of my go-to sweaters and the straight across ruffle adds a feminine edge to your every day fall or winter attire. Next up... one of my all-time favorite designer handbag companies. 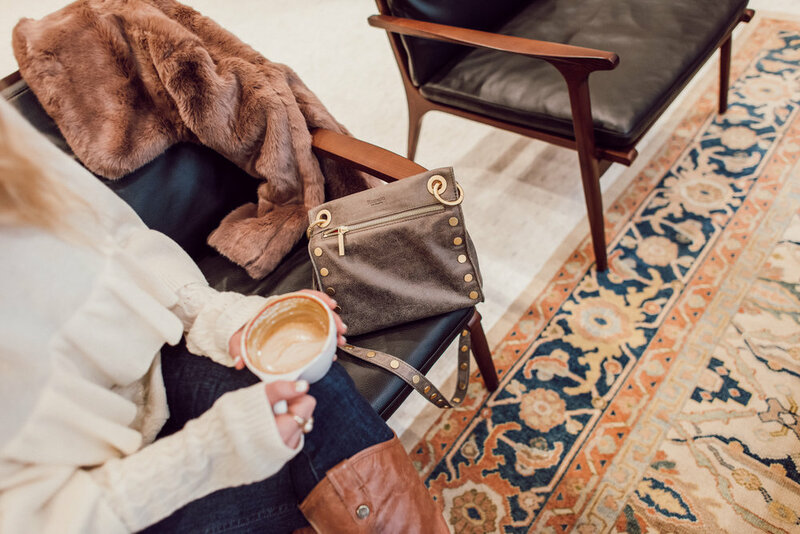 I've been a fan of Hammitt for years, and I always find myself reaching for their timeless and distinct riveted bags. Here I'm wearing the Tony Crossbody in Pewter/Gold. The attention to detail and craftsmanship is evident with every Hammitt design, and the quality is outstanding. Next I've got my eye on their beautiful Oliver Tote and the 395 North Wallet.